The hilarity which ensues on a canoe trip involving Kevin Callan continues. Here we start the day with coffee (obviously) but it’s Kevin’s turn to drop it. This is a technique I learned from a Norwegian I met in a remote hut high up in the mountains, while undertaking a ski tour. 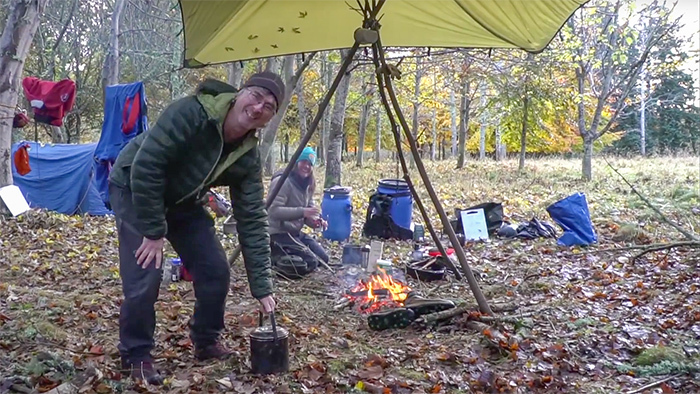 It works really well in kettles and camp cooking pots which have a bit of depth to them – the classic billy can. It turns out to be harder than it looks but Kevin gets there in the end, with the right result – fresh coffee without grounds floating around in it. After coffee, Kevin shows his on-river clothing and personal equipment, and highlights some differences to what he normally wears in Canada. Then we are off down the river for some more paddling. Along the way Kevin highlights some features of historical interest such as Telford‘s iron bridge across the river at Craigellachie. Made campfire coffee in the Mourne Mountains this morning and it worked great! Delicious coffee without having to carry any extra equipment brilliant advice and no more instant coffee! One of nicest ‘less is more’ outdoor techniques i’ve come across. Thanks for sharing it. A question about the coffee grounds used, do you prefer the finer grounds or a bit more coarse? I’ve tried both and had nice results with a coarse grind but kept having some ultra light particles that simpley wont’t drop.